Shelter-Rite Brite architectural fabrics are available with Kynar fluoropolymer and Tedlar fluoropolymer topcoats. 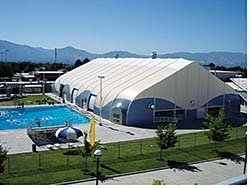 The fabrics are used to create pre-engineered frame, air-supported and custom engineered tension structures. The top coats improve weathering, color fastness and cleanability.